When PC system breaks down or in need of tune up, we will sent the PC to mechanic or repair. Indeed, there is no need to send the PC anywhere with System Mechanic from iolo.com. The multi-award winning software – System Mechanic features automated cleaning, removes over 50 types of hidden junk files, maintenance repairs errors, fragmentation, fix hard drive errors, and tunes up PC to maximize PC performance. System Mechanic is a reliable utilities software with up to 300% faster for Internet access speed up, download acceleration, launch high-demand apps. The software can finds and fixes over 30,000 different problems using intelligent live updates from iolo Labs to keep PC stable and error-free. In addition, it also can removes bloatware, protects privacy and security, safely wipes sensitive browsing history, blocks dangerous system changes, and more. 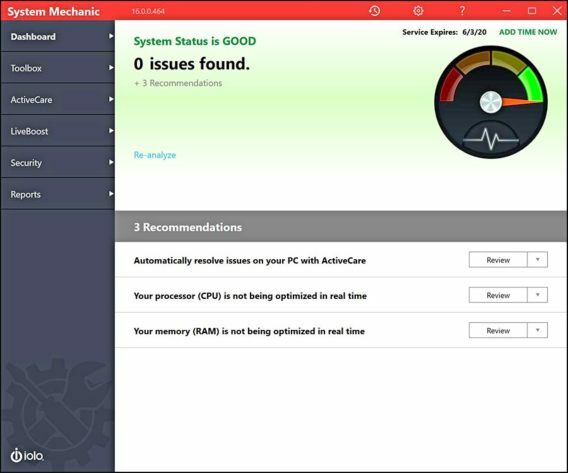 ActiveCare – Advanced cleaning and repair removes more unsafe clutter and fixes more problems than ever before, going to work whenever your PC is idle. LiveBoost – Adjusts dozens of Windows settings for greatly improved processor, memory and hard disk stability and performance. PC Cleanup – Cleans up over 50 types of junk files. Privacy Cleaner – Wipes internet and chat history, clutter and cache. Registry Tuner – Defrags, compacts, optimizes and backs up system registry. Program Accelerator – Re-aligns and defragments disjointed program files for the very fastest access. Startup Optimizer – Blocks bloatware at startup to accelerate boot time and improve system performance. NetBooster – Speeds up Internet, videos, downloads and games. Memory Mechanic – Reclaims wasted RAM in real time. Security Optimizer – Finds and plugs Windows security holes with the latest available patches. Privacy Shield – Lets you turn off aggressive Windows personal data collection services otherwise difficult to disable. Incinerator – Safely and permanently deletes unwanted sensitive files. System Mechanic costs $49.95 to purchase. Users who download System Mechanic trial version from iolo.com will get only 30 days trial period. Now, interested users can get free 1 year licenses for iolo System Machine. Enter the code “CHIP2018”, and then fill in email address and click “Request a FREE license key” button. An activation key will be sent to registered email within a few minutes. If do not receive an e-mail, please check the contents of the SPAM folder in email, the message may have been classified as advertising. Follow email instruction to download and install System Mechanic, and then use the activation key and click on “Activate now” button to activate the software to full version product.